2010 has been a year of ‘war’ at Anfield, as it has been since the end of the first year of previous owners Tom Hicks and George Gillett’s reign. New owners are now in place but the infighting continues, especially when the club’s previous manager or managing director are brought into the conversation. In most cases the fighting is from people fighting for their club, which is still miles away from where it should be and with no outward sign of anything being done to stop the rot. But as we fight for our club we fight with each other. At this time of year it’s traditional to try hard, and it often takes a hell of a lot of effort, to get along with people who you really don’t get along with. Maybe it’s a good time to reflect on some of the bitter battles waged between fellow supporters of this club in recent months. Is it time to consign that to history and to stand together for the club we all love? We can still fight for change, for improvements, for the return of this club to what we all know it should be. For fellow fans there will always be issues we don’t agree on. Everyone has their own feelings on what exactly should be changed, or how or when it should be changed, but rather than trying to force our views on each other we need to try and persuade each other. We need to listen, we need to try and remember that everything doesn’t have to be so black and white, and rarely ever is. The closer we stick together the more powerful we are. 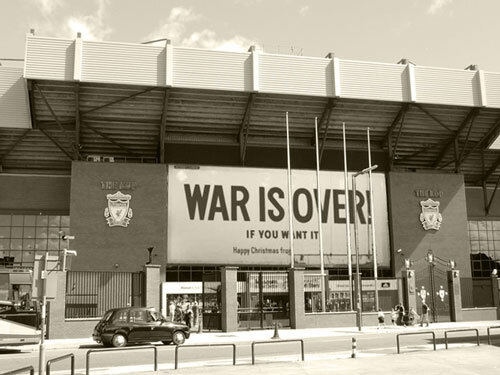 In the words of Liverpool’s very own John Lennon: War is over – if you want it. I’m watching this with tears in my eyes. What a brave young fella. Nice of the senior players to make his day a special one. One day maybe they can find a cure so he can be pain free.